Enjoy the peace and quiet of 780 hectares of bush with more than 100 species of game and prolific bird life. 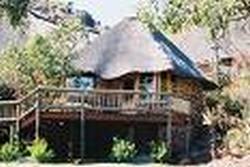 Combine tranquil surroundings with a bit of adventure and visit this four-star graded Lodge situated a mere 39km north of Middelburg, Mpumalanga. Full catering is provided complimented by 10 comfortable rooms, all with en-suite bathrooms, a bar and pool deck with panoramic views across the valley and conference facilities for up to 10 people. The cuisine is typical South African. Game drives and guided quad bike trails as well as horse trails are available. 39km North of Middleburg on the N11 enroute Groblersdal.